Ladybug arrangement prices are based on the type of flowers used and the time involved in the creation of the piece. This pricing method is straightforward and allows the customer total control on the arrangement style and budget. For instance – a large table arrangement could be $25 – if made of carnations and daisies ($2.00 each stem) or $100 – if made with imported orchids and calla lilies ($8.00 each). 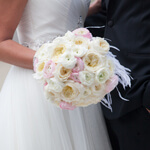 This method lets you decide what style of flowers best suit the event and and will best fit your budget. Each venue has its unique characteristics. Some halls are modern and call for a more contemporary design. Others are more traditional and require a more subdued and elegant floral treatment. If you would like one of our staff to visit your venue and help design your flowers to suit the specific space, we are happy to do this. There is a $50 charge per visit and requires one week notice. Our design staff are happy to meet with you to discuss your wedding plans. We are open 7 days a week and appointments can be made to suit your schedule. There is no charge for wedding consultations. However, if you would like us to come up with designs/sketches/photos for your wedding, or develop a quote there is a $25.00 fee. If you decide to have Ladybug provide your wedding flowers, this amount will be credited towards your flowers. Ladybug staff are trained to deliver the flowers to the appropriate venue at the appropriate time and in top shape. 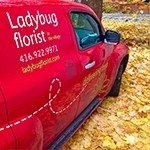 Ladybug will deliver your flowers anywhere in the Greater Toronto Area. Deliveries in Toronto are $100 per stop. For instance, delivering the boutonnieres to each guest?s home will be $100 each delivery. Delivering all ten boutonnieres to the reception hall is still $100 We charge an additional fee for deliveries outside of Toronto. (Deliveries outside this area can also be arranged.) Clients often will arrange to have a number of pieces delivered to one central location – i.e. the reception hall, to save on delivery costs. Delivery consists of drop off only. Set up if required is an additional charge. Simple delivery and and placement of arrangements is included in the delivery fee. (i.e. placing altar arrangement). Ladybug can however also assist you with extra help on the day of your event if you need it. Setup fees start at $50 and may include duties such decorating a wedding gazebo/chuppah on site. We offer some non-perishable items (glassware, vases, etc.) at half price as a rental. The client is responsible for any damages/losses during their use. Once we have agreed to the details of a quote, Ladybug Florist will draft up a summary/bill. This also includes a schedule of delivery times, places, and items that the wedding party may still need to arrange (i.e. ribbon to be delivered to Ladybug Florist by a particular day.) Both parties sign this, and it confirms the quote. Ladybug Florist is obliged at that point to provide the flowers as listed – exactly at the price listed. A $100 deposit is required to book the wedding date. As a small shop, we prefer to do only a few events per day. That allows us to give you our undivided attention. The deposit can be done well in advance, even before all of the details have been worked out. That way it guarantees Ladybug Florist for your special date. Payments can be made once the quote is agreed on. Full payment is due one month before the wedding. We accept all major credit cards, etransfers and debit card. In case of cancellation more than 3 weeks away from the date, only the $100 booking fee is held as a cancellation fee. Cancellation 3 weeks or closer to the wedding, 25% of the payment is held. Cancellation during the week of the wedding, 50% of the payment is held.